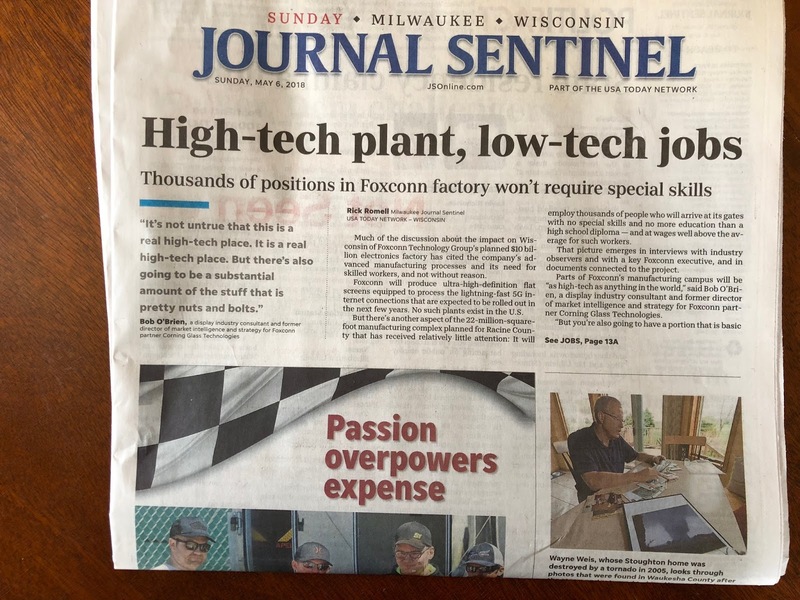 I'm not sure why Foxconn's intention to hire thousands of lower-skill workers for lower-tech-and-wage jobs in Wisconsin is worth the Sunday Journal Sentinel hard-copy banner. Walker's initial Foxconn hype focused on new jobs averaging about $54,000 annually, but Wisconsin is now acknowledging it will subsidize those at the $30,000 level. Assembly Republicans introduced revisions to the bill Friday. The new version retains the tax breaks but ties them to jobs created that pay at least $30,000 and exempts salaries over $100,000 from the calculations. With 2,080 hours in a working year - - 40 hours x 52 weeks - - the subsidies to Foxconn will include jobs paying less than $15 per hour. And aren't these the kind of jobs open to automation? And will Foxconn be paid by Wisconsin taxpayers when these jobs are created, then robotized out of existence...? One more thought: A financial calculator finds the average income needed for a family of four to live a "modest but adequate" lifestyle in Kenosha County is $81,457. Chinese media and The Detroit News are reporting that Tawian-based Foxconn is eyeing a Michigan investment in driverless car, artificial intelligence and other high-tech fields. So... it's worth asking in light of the Michigan-focused reports if states will be played off each other for Foxconn investments, and if Wisconsin is overpaying with its $3 billion incentive and water-rule bending package while Michigan has pledged $200 million, and whether artificial intelligence and driverless car technology have more lasting growth potential than flat screen television and other LCD panel manufacturing. 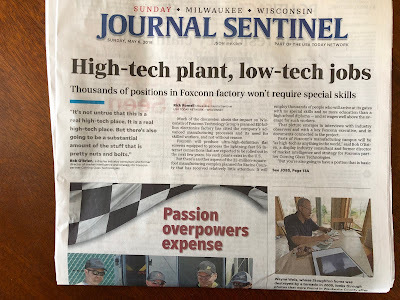 Final thought, and as I've pointed out often, that the WI Foxconn plant is in GOP Assembly Speaker Robin Vos' district, and needs to attract thousands of lower-income workers who are less likely-to own cars to an area Vos has worked hard to strip of regional transit coordination and connections is just plain stupid. The posts cited above are at this archive. Final thought: It's no secret that development and opportunity in SE WI have been distorted by anti-urban public policy decisions that disconnected minorities who are concentrated in Milwaukee - - the biggest city in the state but landlocked by state law - - from jobs, housing and other regional benefits. I am also adding here a link to SEWRPC's most recent report on affirmative action, hiring and staffing, and note that, as it has in the past, the agency says in these reports that it continues to struggle attracting minorities to its most-senior positions. Transit services have -- at least temporarily -- been terminated by Waukesha County to the Commission’s primary work place in the Waukesha area. Today 38 percent of Commission employees commute from Milwaukee County residences. The Commission has long recommended in its plans, and advocates strongly for improved transit service to job centers throughout the Region. The Commission has identified the severe transit funding problems in the Region, and the need for dedicated funding. Yet I cannot respect the Republicans in our State Legislature who have done so very little to help the minorities located in southeastern Wisconsin into our society. Their attitudes, behaviors, political actions, etc. are indicative of a very obvious white racist stance that is simply not acceptable to our great State.